On my journey towards healthier eating my biggest struggle was quitting chocolate, I could go weeks sometimes months without it but then I would relapse and eat 2-3 family packets within minutes! Then I made an amazing discovery, chocolate is healthy for you!!! Not the supermarket kind but homemade chocolate and it’s so simple to make. When buying Cacao (not cocoa) purchase 100% organic and remember to check the ingredients to make sure it’s 100% cacao with nothing else added. Cacao contains Phenylethylamine, Tryptophan and Anandamide . All of these contribute to making you feel good and happy. Phenylethylamine aka “love drug” stimulates the nervous system and triggers the release of endorphins. It causes changes in blood pressure and blood sugar levels leading to feelings of alertness and excitement. Phenylethylamine is called the love drug as when we fall in love and reach climax Phenethylamine increases in the brain. Tryptophan is a precursor to Serotonin which is known as an anti-depressant and helps to reduce PMS symptoms. Anandamide “feel good chemical” is unique due to its resemblance to Tetrahydrocannabinol (THC), which is a chemical found in marijuana. Both activate the same receptor which causes the production of dopamine, a neurotransmitter which leads to feelings of well-being that people associate with a high. Cacao has 20 times the amount of antioxidants than Red Wine. 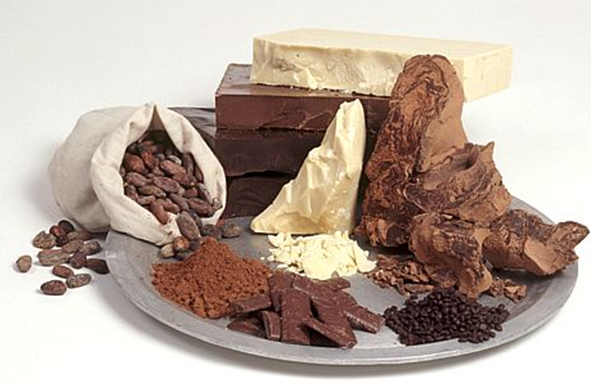 Also, flavonoids in Cacao protect cells against damage, especially to the Heart, arteries and veins. Organic raw cacao powder has an oxygen radical absorbance capacity (ORAC) value of 95,500, while red wine has a value of 2,400. Cacao beans are rich in a number of essential minerals, including magnesium, calcium, iron, zinc, copper, potassium and manganese and contain vitamin; A, B1, B2, B3, C, E and pantothenic acid. 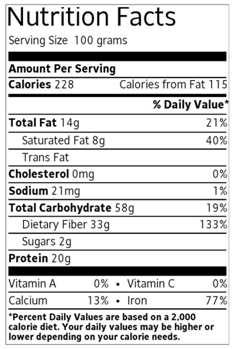 Below is a nutritional label based on a 100 gram serving size.